Have I mentioned our family loves puzzles? We made sure that the girls, even from a small age had tons of puzzles lying around to play with and I am proud to say they are all whizzes at puzzles now (and mazes too). Hubby and I even spent a lot of our honeymoon in a rustic cabin on the Oregon coast relaxing and doing puzzles. 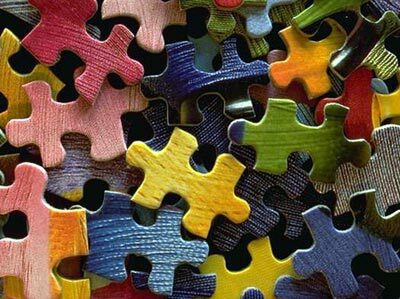 Puzzles have been an awesome learning toy through the ages for parents and kids alike. They are not just for fun and games though, as they also provide a number of benefits as well, such as increased memory, problem solving, eye-hand coordination, spacial skills, visualization, and keeping your mind sharp as you get older. I just found a fun online puzzle site I thought I would share. Once you register, you can submit your OWN photos and either make them private just for you, or you can share and make them public for other people to enjoy. You can design them with just a few pieces or with many, it's up to you. You can also browse other people's submissions, and the site is family friendly. If you have a competitive streak, you can try to do them in the fastest time and have your scores posted up with other puzzle makers. If you don't care about time or scores, you can just enjoy your puzzle at your own rate. Click here to go to Jigidi puzzles and check them out! I really like that you can select by category (outdoors, animals, nature, etc), plus check out the category for kids. My girls have had some fun doing on line puzzles with the Disney characters, princess, Mickey Mouse, and cute puppies. So challenge yourself with some mental gymnastics and do a few fun puzzles today!